Demonstrating that the crews have lost none of their competitiveness over the winter break, at the end of day two of fleet racing at the RC44 Bermuda Cup, the top two boats are tied on points and just two points separate the top three. Great Sound took on yet another personality today as a front rolled over Bermuda - chillier, more overcast and with shifty winds, which typically were in the early 20s and kicked up a short chop. The result was some highly tactical beats, followed by some hang-on for dear life, faster than a speeding bullet downwind legs. Stand out performer for a second day was Igor Lah's Team CEEREF. Following its two bullets yesterday, the Slovenian crew continued its winning streak today, claiming the first two races. But both were hard fought affairs. 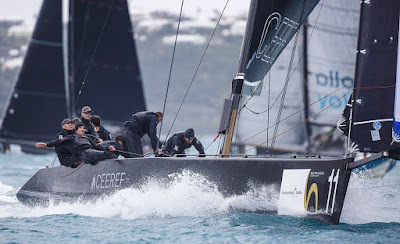 In the first race Team CEEREF was mid-fleet around the top mark, but made gains gybing early on the first run and was up to second at the second weather mark rounding, finally pulling ahead on the last leg. Race two saw her have a stronger first beat, rounding the top mark second behind John Bassadone's Peninsula Petroleum Sailing Team. 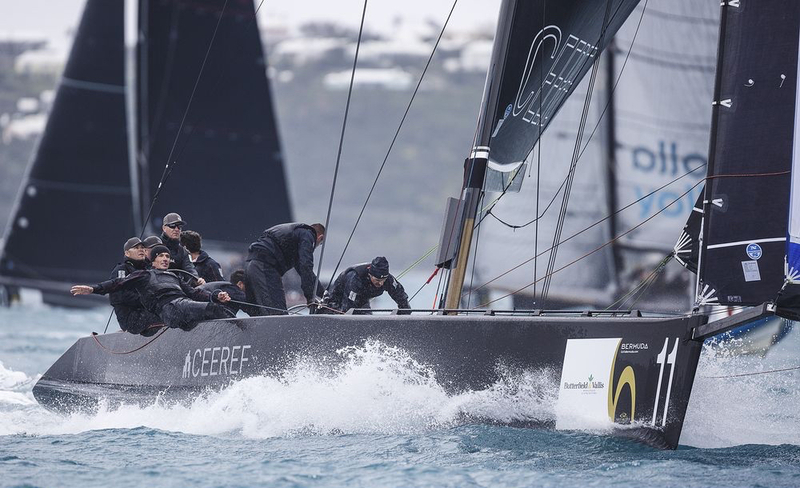 Coming into the top mark with rights on the second beat, Team CEEREF pulled ahead and hung on all the way to the finish. "The crew work is brilliant - the guys are doing really fine and Ado [tactician Adrian Stead] is calling some nice shots. Everything is as it should be!" beamed Igor Lah once ashore at the Royal Bermuda Yacht Club. "We are happy to throw the boat around in the breeze and Igor does a fantastic job of driving the boat both upwind and downwind. 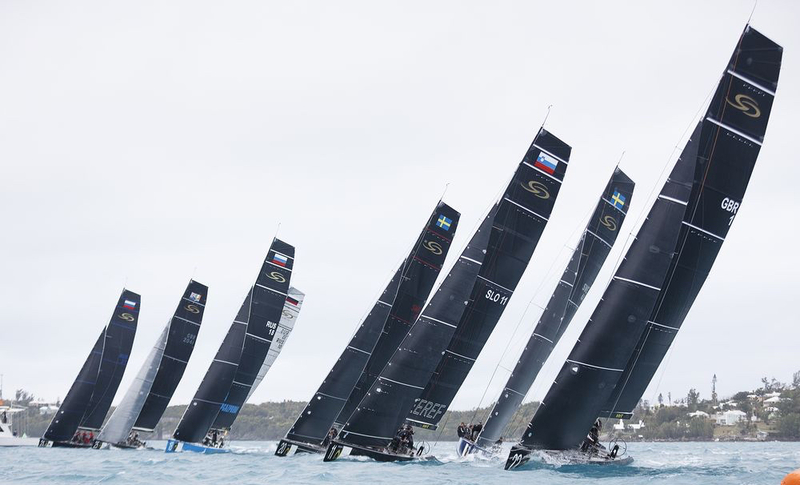 He is never phased by anything, even the windier it gets.We have come a long way from Malta, our first regatta last year, where we kept wiping out and breaking spinnakers - this is a credit to all of the guys on the boat," Stead added. He said that the boat was going well upwind thanks to a few tweaks they had made to the rig. Going into the final race, Team CEEREF was tied on points with Chris Bake's Team Aqua, both just one point astern of the leader, Vladimir Liubomirov's Bronenosec Sailing Team. 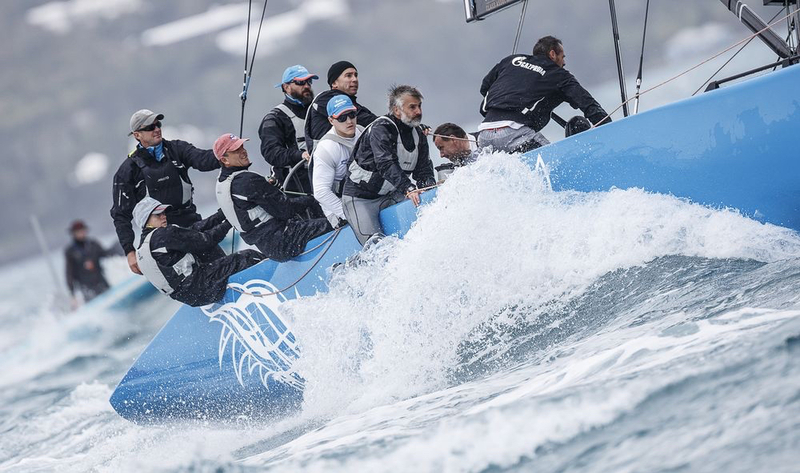 With the wind showing signs of reaching the 25+ knots forecast for the afternoon, today's third and final race saw Vladimir Prosikhin's Team Nika take the win, her first of this regatta, where she is finding her feet with some new crew. This she managed on the first beat, by edging ahead out to the left and then crossing ahead of everyone after she'd tacked back. Team Nika, the defending fleet racing champion, has had a slow start to this regatta, starting today in unfamiliar territory - the bottom half of the fleet. 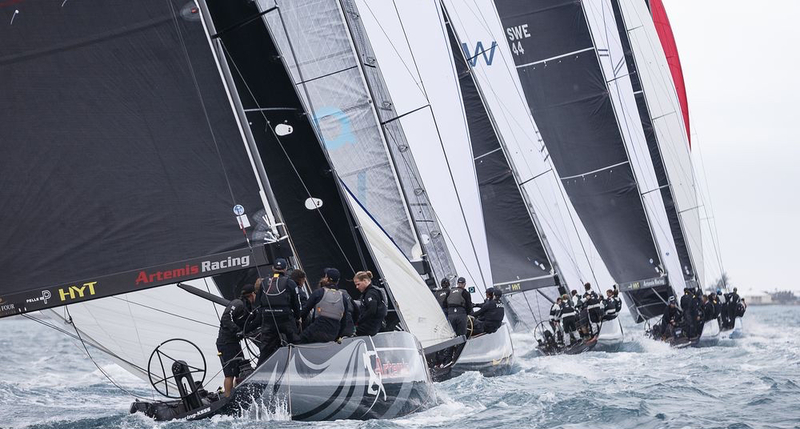 Matters got worse in today's second race when they trawled their kite at the top of the final run causing several expensive items of gear to go 'ping' down below. However in the final race they redeemed themselves. "The last race showed that the guys can perform and there's still potential and let's hope that it is a climb-up," mused Prosikhin. "It is much better to have 4-8-1 than the reverse!" Tactician for Team Nika this season is Ed Baird. "It was an interesting day because we had some rain come through, some breeze and occasionally less breeze," said the 2007 America's Cup winning helmsman. "Downwind the puffs were very important." Their race win was not enough improve Team Nika's fifth place. 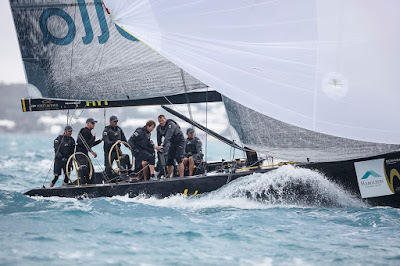 Similarly a fourth place for Team CEEREF left her third overall, two points adrift of Team Aqua and Bronenosec Sailing Team, the joint leaders after seven races, demonstrating just how close competition is here on Bermuda's Great Sound. 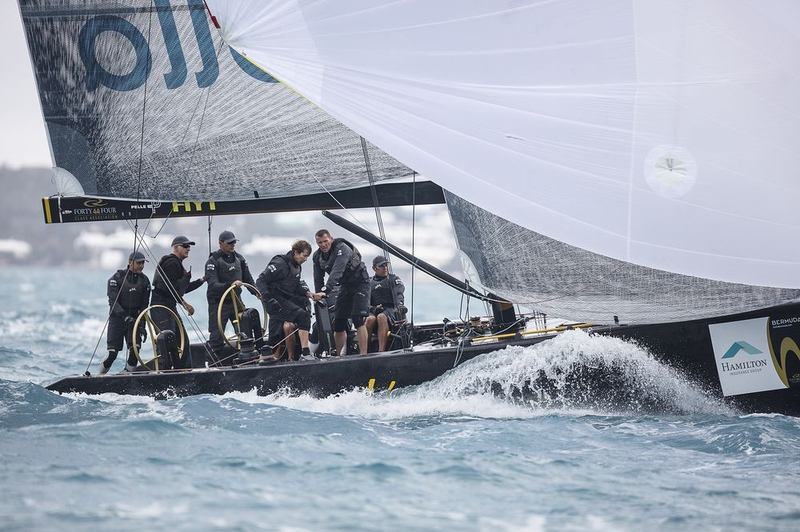 Of great relief to the class was the welcome return of Torbjörn Törnqvist's Artemis Racing, after she was severely holed in yesterday's first race. Intensive overnight repairwork was carried out on the 1 x 0.6m section of damaged topsides by boatbuilders at the Swedish team's America's Cup base where the final layer of laminate went down around midnight. After a new vinyl cover had been applied to the repaired section of hull shortly before racing this morning, the repair was difficult to spot. With racing finishing early today, the RC44 sailors took the opportunity to go on a tour of Artemis Racing's newly opened America's Cup base.